It is not always easy to find out how old your row house is, especially if it was built before 1900, and even more so if it was a dwelling for the working-class. However, it helps to have someone put the date the row was built right on the side of the house. I intended this to be an article about cute little row houses, situated in lovely gardens, in the middle of blocks, providing an urban oasis for those who don’t mind living with a little less space but I have discovered that the little homes of Bell’s Court tell a captivating story. 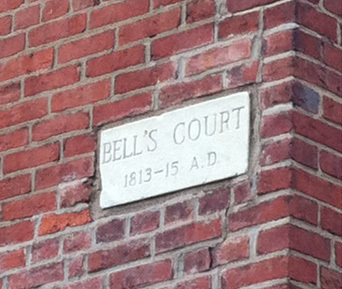 Alan Heavens, Inquirer Real Estate Writer, wrote about Bell’s Court last year (http://articles.philly.com/2013-07-29/business/40850220_1_bell-society-hill-trinities). 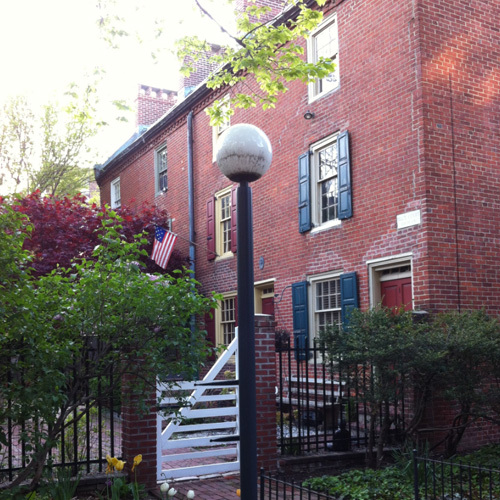 Heavens writes that originally, the land the row homes sit on, was part of the garden of a very wealthy local Philadelphian named William Bingham, who, among other things, represented Pennsylvania as a delegate to the Continental Congress from 1786 to 1788. However, Bingham didn’t build the homes. That was wallpaper designer/manufacturer Thomas Hurley, who built not only the four present row homes but also an additional row of four row houses so that the two rows faced each other. Thanks to the little masonry note, we know the homes were completed in 1815. Philly History is a wonderful archival website and I discovered the following photo that shows the remaining row in 1961. Surprisingly, there are cars parked in front and behind! You’ll see in photos below that it’s completely different today thanks to an urban revitilization of Society Hill, beginning in the 1960s, that saved many historic homes from demolision, including these, and restored the greenspaces. 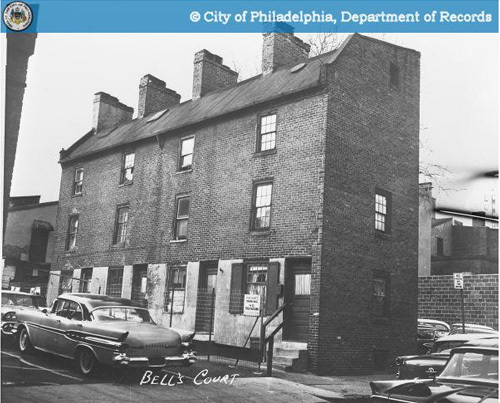 The row homes of Bell’s Court are indicative of the typical “Trinity” style houses that were built throughout Philadelphia during the population boom of the 19th Century. Many of this type of home were expanded in later renovations but, as indicated in the historic photo, it appears that the row was surrounded by streets. Therefore, with no room to expand, we are left with the original footprint and an intact glimpse into 19th Century working class domestic life. Inside, the homes feature two bedrooms, one bathroom, and likely have at least one working fireplace. Other distictions include the ever challenging, or intimidating, spiral “pie slice” stairs and classic Federal six-over-nine/eight-over-twelve windows. There is one room on each floor, with the kitchen located in the basement. Altogether, the homes are just slightly over 650 square feet, which is on the generous size for houses like these which range (originally) from 400 to 550 square feet. A unique feature is the loft over the top floor, seen in the historic photo above. Normally, you don’t get the extra space and it’s a nice feature on a very small house. Today, Bell’s Court is assessable via pedestrial walk-way and the streets and cars have been replaced with a beautiful garden. 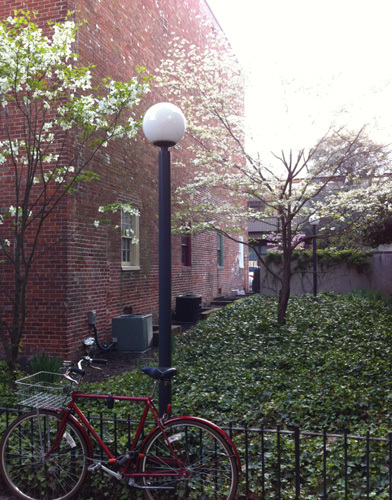 It’s one of those charming secret rows that we absolutely love discovering in Philadelphia. To read more about how the current residents live in their homes, see Heaven’s article – http://articles.philly.com/2013-07-29/business/40850220_1_bell-society-hill-trinities.